Spirit Halloween has officially released all of their 2018 products for order online, and we are excited to feature many of this year’s hottest items in the coming weeks, but first up is hottest name in gaming among a certain age group right now, as fans of Fortnite (of all ages) can look just like their favorite characters from the popular game. Spirit’s new 2018 lineup includes numerous costumes and prop accessories for various characters from the Fortnite: Battle Royale video game, plus an insane Battle Bus inflatable decoration that is more than 17 feet tall. These costumes and accessories join other new 2018 Halloween decorations, including the Michael Myers Halloween H20 animatronic, the Chucky free-roaming animatronic, and the life size singing Sally from The Nightmare Before Christmas, as well as many more original characters, all of which you can see here. You can see some of our favorite Fortnite costumes with links to purchase below, and if you don’t see what you’re looking for, you will probably find it in the complete Fortnite collection (including kid-sized costumes) at the official Spirit Halloween site here. Click on any of the links below to purchase or shop here. Show everyone you’re a bonafide winner this Halloween when you bring out this officially licensed Fortnite Skull Trooper costume. This epic skin costume is super rare and will strike fear into any unsuspecting no-skins you come across this Halloween. It includes everything you need to collect candy in skeletal style including a skeleton jumpsuit, black gloves, bandana, belt, shin guards, ammo pouch, and of course, the signature Skull Trooper mask. Assemble the squad and show everyone who really owns Haunted Hills this Halloween with this amazing Skull Trooper costume. Now you can dress up as this skeletal stud skin with this officially licensed hooded Skull Trooper mask. The Skull Trooper’s whereabouts have been unknown since the Fortnitemares event. 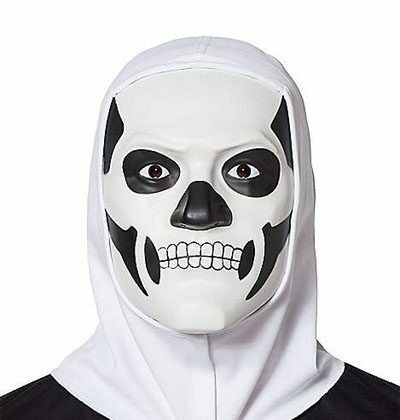 This black and white hooded skull mask is the signature piece to any Skull Trooper costume and will have you looking just like you came off the battle bus. Will your Halloween victory royale be all that you ever dreamed of? Or will it end up being a complete Fortnitemare?! The future looks bright for you this Halloween when you decide to rock this officially licensed Brite Bomber skin costume. Straight out of the sunshine and rainbows set, this rare skin is for those who like to make a vibrant entrance to the party. It features everything you need to be bright and boisterous this Halloween including the Brite Bomber’s purple jumpsuit and pink costume t-shirt with a unicorn llama on the front flying through the clouds. This costume also features gloves, a belt, and some aviator sunglasses, so you can stunt on anyone who tries to throw some shade your way! From the vast darkness of deep space comes this officially licensed Fortnite Dark Voyager skin costume for you to rock on Halloween night. This Dark Voyager costume is out-of-this-world and includes everything you need to become this awesome astronaut. Featuring a black jumpsuit with knee pads and harness as well as boot covers, gloves, and signature helmet, this costume will have you prepared to explore any mysterious rifts you come across. From the depths of Wailing Woods, emerges the chivalrous Black Knight. This officially licensed Black Knight skin costume is a throwback to the season two Battle Pass. It includes a full set of knight’s armor, including a sleek costume top, bandana, belt, shin guards, pouch, and of course, the Black Knight helmet. This costume was featured in the Fortknights set and has become a rare sight in the game. Fight for your honor this Halloween when you dress up in this officially licensed Black Knight costume. Get ready to hug it out with your enemies this Halloween while sporting our officially licensed Fortnite Cuddle Team Leader skin costume. This comfy, pink hooded jumpsuit is equipped with a white belly and black broken heart in the center, as well as its signature belt buckle across the front. Trust us, wear this Cuddle Team Leader skin costume and you’ll be ready to break hearts all while riding some shopping carts all night long! Give hugs all around this Halloween when you put on this officially licensed Cuddle Team Leader mascot head. This lovable, legendary skin just wants to spread some love and steal some loot! Our hot pink Cuddle Team Leader head is designed with a heart-shaped nose and three back buttons for easy on and off. Consider this mascot head the ideal piece you need to perfectly replicate your Cuddle Team Leader look this Halloween. Shop more Fortnite costumes here!